Yesterday I was Going Through my Square Stash (tunneling toward Neatness) and ran across a square that was *just*the*thing*. 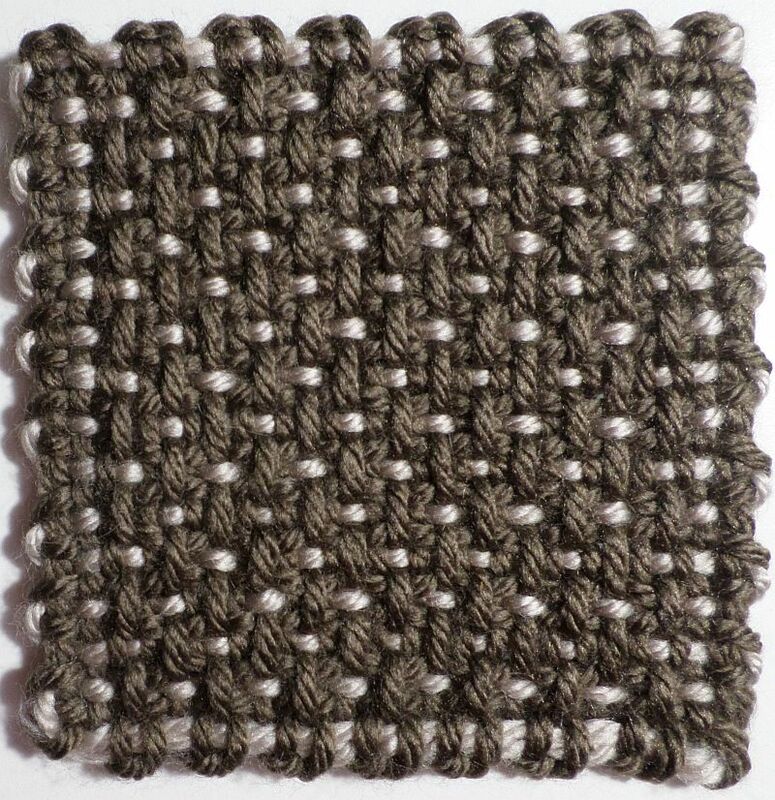 Some squares turn out that way—the right yarn thickness, the right pattern and colors, and an appealing texture. Why do pin loomers use three-layer warping? What are the differences between 1-, 2-, and 3-layer warping? 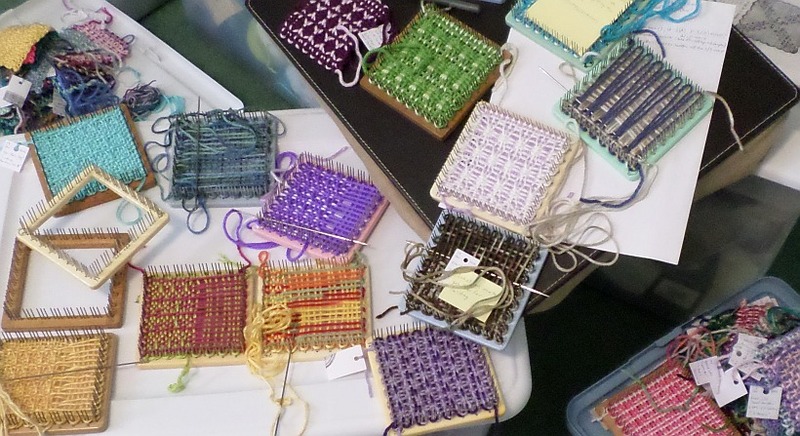 How do we decide which warping method to use? Enough time has passed since I last considered the issue of shrinkage that I had to check to see if I’d written about it before. I have, here: Shrinkage — Beginner’s Corner. I guess this post makes my second time approaching the subject. As I do more projects I’m thinking these little practice sessions will come in handy. 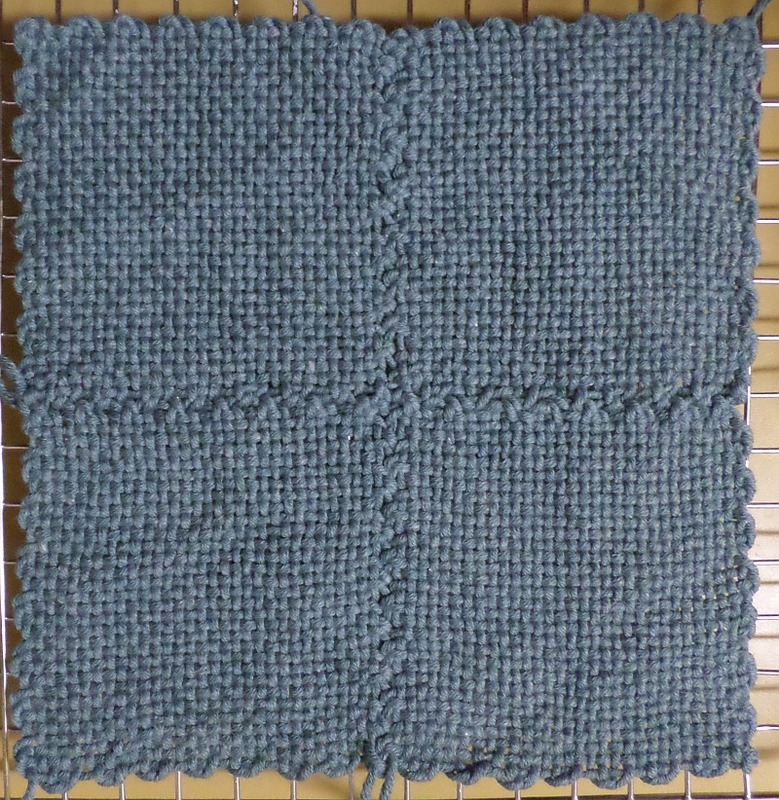 Two squares woven with the same yarn on the same loom. 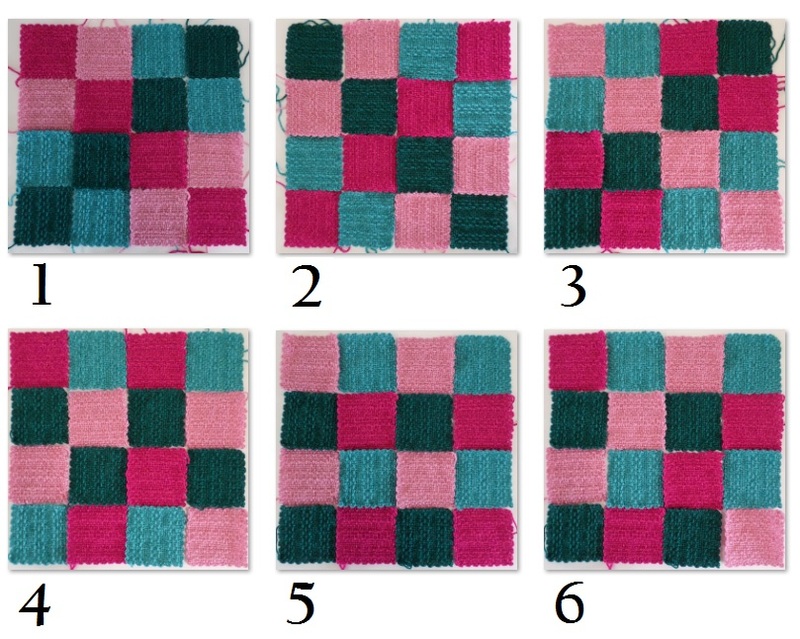 My original intent was to weave four squares: 1 aqua, 1 green, 1 pink, 1 fuchsia, but decided it would be better to weave four of each. So I did. This post begins a series of two-layer warping (2LW) instructions. 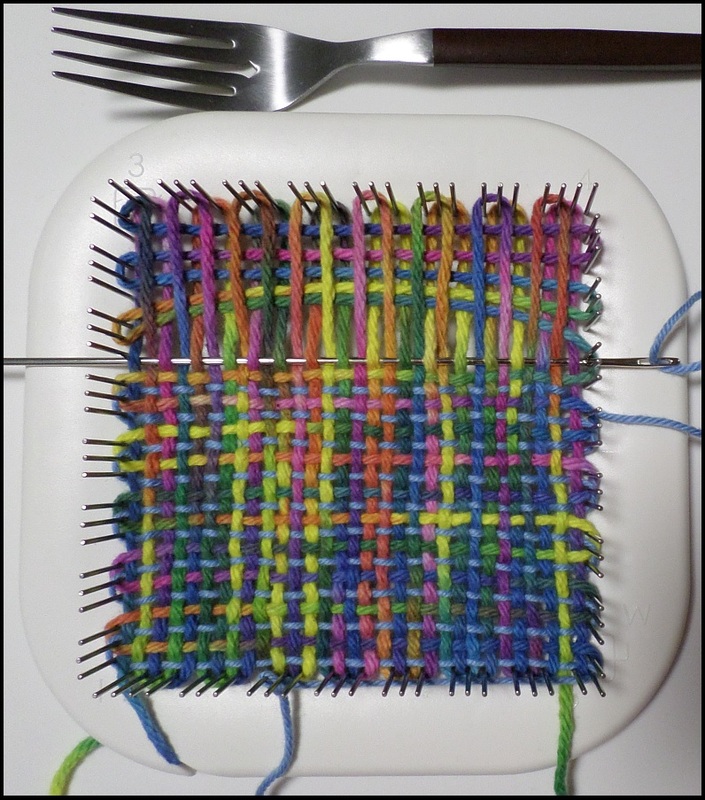 I haven’t done much exploring of this weaving method, and haven’t invented many patterns yet. There are a number of patterns available in 100 Pin Loom Squares by Florencia Campos Correa and there are a few available in the vintage pattern booklets on eLoomaNation.com. And I’m in the process of inventing more. Please check out my video series demonstrating the techniques described in this and the following posts. 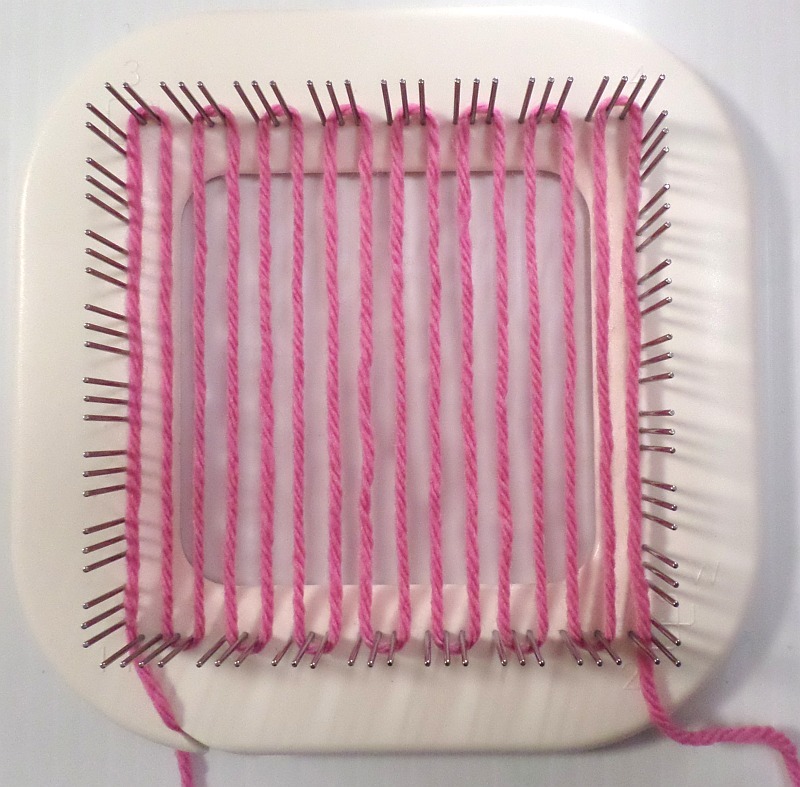 Samples featuring pink yarn and the Zoom Loom are the most basic method for 2LW. If you want to eliminate all the fancy distractions, follow those photos. By the way, if you are a Zoom Loom user, I strongly recommend you purchase a longer needle to make weaving more comfortable with its wide frame. The turquoise yarn/cream-colored Weave-It photos will show how to prepare the loom if you wish to work the beginning yarn tail in as you weave. It also shows a warping variation at Cr2 that might make weaving a bit easier. Anchor the yarn tail in the notch at Cr1. (If using a different loom you can tie a slip knot, leave the yarn tail hanging, or use a method that suits you.) Warp L1 as usual. Finish at Cr2. An interesting question came up on the Facebook Pin Loom Weaving Support Group in response to yesterday’s post about using cotton yarn on the pin loom. Is there a way to add a little bulk, so as not to have a too-open weave, and still make weaving with cotton easier? This is the first in a series on selecting yarn appropriate for use on Weave-It style pin looms (this includes Hazel Rose Multi, Weavette, Wunderwag, Zoom, and other similar looms). Who doesn’t love cotton? It can be super tough to use on a pin loom though. Weavers need to realize there’s a thing called take-up. Each time you add a new weft row, the warp threads all have to bend the slightest amount around it—that’s take-up. If you’ve warped your loom tightly, there won’t be room for take-up, even if your yarn is stretchy. 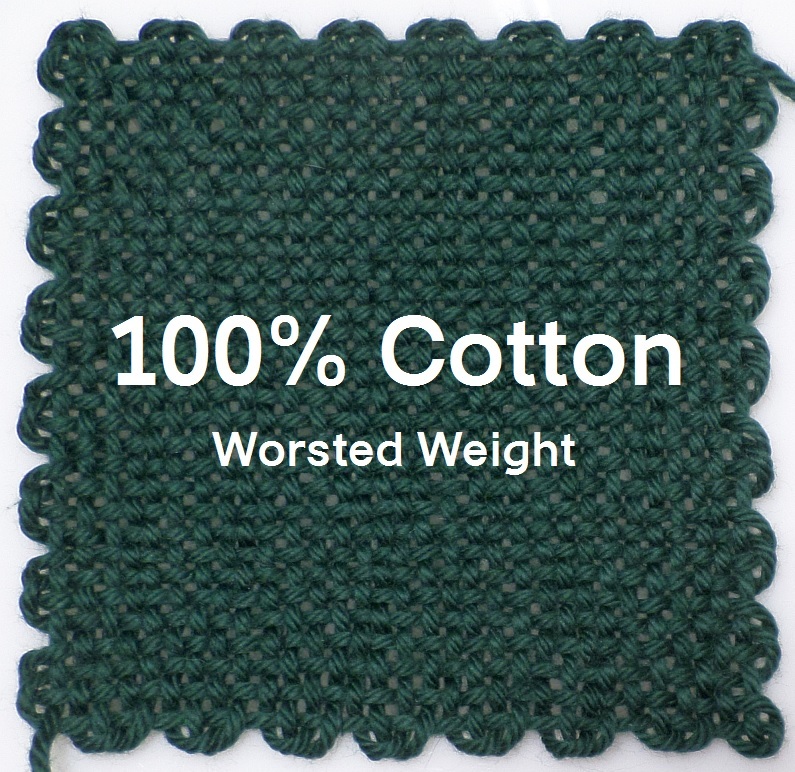 Cotton yarn is characteristically non-stretchy, and worsted weight 100% cotton is one of the more difficult yarns to use on the pin loom. One of the gals over on the Facebook Pin Loom Weaving Support Group is always reminding us to sample and check for shrinkage. I’ve done this, like one time, so here it is!